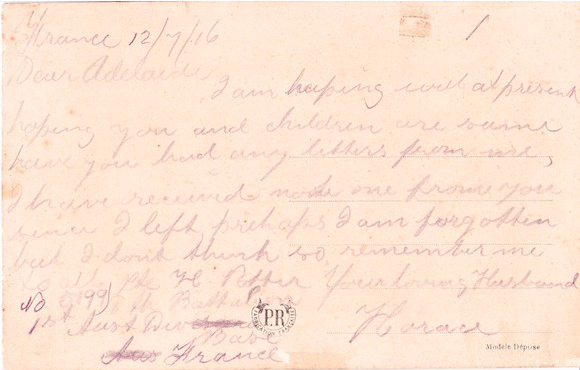 Ballarat student Laura Benney's great-great grandfather's last letter written from the trenches on the Western Front. Families from Ballarat will learn about their own wartime history at a two-day War Heritage Roadshow that kicks off on Wednesday, 26 April. Trench art, letters and uniforms are among the war memorabilia that will be examined at the Antiques Roadshow-inspired event in Ballarat featuring Australia’s top preservation and conservation experts. It is part of a state-wide War Heritage Roadshow, a Victorian Government initiative being delivered by the University of Melbourne Grimwade Centre for Cultural Materials Conservation. The roadshow is designed to help preserve Australia’s wartime history, from the Boer War to the most recent conflicts, and give families and communities the tools to care for their memorabilia at home. Mr Eren said the roadshow was part of the Victorian Government Veterans Heritage and History Strategy to safeguard our wartime legacy for future generations. “Ballarat has a strong and proud military history, starting with the formation of the Ballarat Volunteer Rifle Regiment in 1858, and it continues today,” Mr Eren said. Ballarat student Laura Benney, 17, is passionate about conserving her family’s war memorabilia, which includes letters, medals and photos. “We have a letter from my great-great grandfather and it was the last letter he wrote when he was in the trenches on the Western Front,” Ms Benney said. Grimwade Centre Director Robyn Sloggett encouraged Ballarat families to bring along their war memorabilia. “This roadshow will help families look after war memorabilia that has been passed down through the generations and to better understand the stories behind them,” Professor Sloggett said. Professor Sloggett said this included letters and photographs but also things like ration books and memorabilia from the home front or archives related to the peace movements. “It’s also important that we think about modern war memorabilia – things like emails, snapchats and Facebook posts – that today’s military personnel are sending home to their families,” she said. The Ballarat War Heritage Roadshow will be held at the Art Gallery of Ballarat, 40 Lydiard St North on 26-27 April. It will move to Bendigo on 28-29 April.